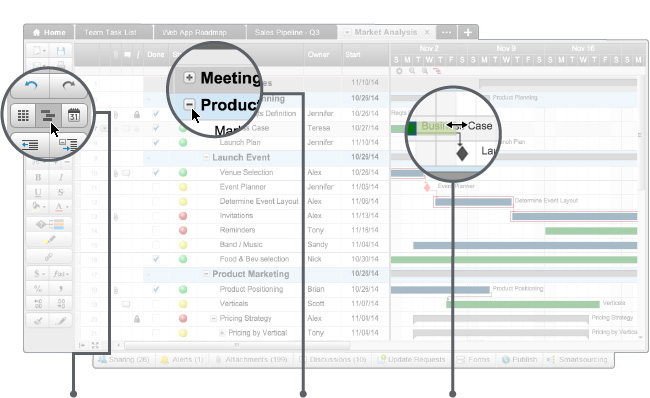 Using interactive Gantt chart capabilities in Smartsheet is a great way to visualize your project. You can customize your chart with conditional formatting to highlight team members’ tasks or indicate status levels with different colors. Turn on critical path to see all the tasks that directly impact your project completion date. Your team or clients will instantly “get it” and understand the tasks and related dependencies. Plus, it couldn’t be easier to update with drag-and-drop editing (even if you’ve never used one before!). Smartsheet makes it easy for your team to collaborate in real-time and stay current on project progress. You can update the project, reassign a task, adjust a date and more within a beautiful visual layout.